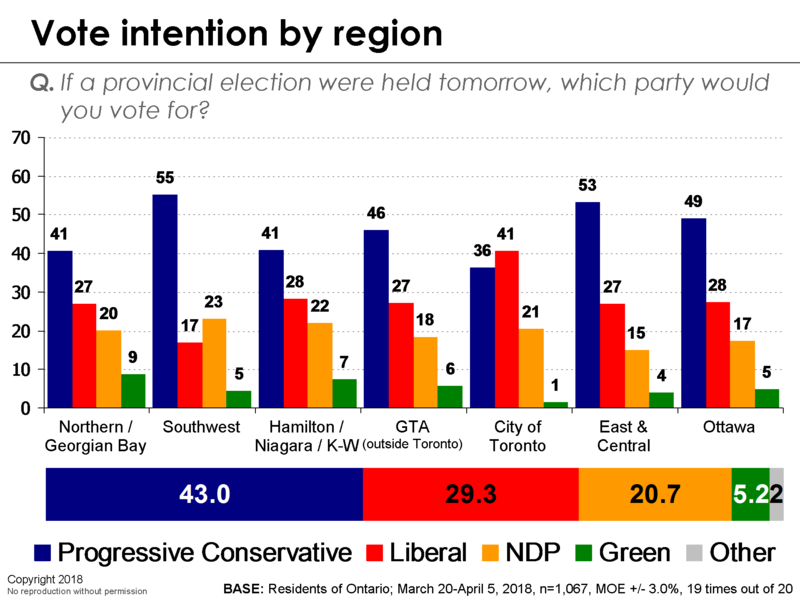 [Ottawa – April 6, 2018] Doug Ford’s Progressive Conservatives have a clear lead which would produce a majority it there were to be an election tomorrow. 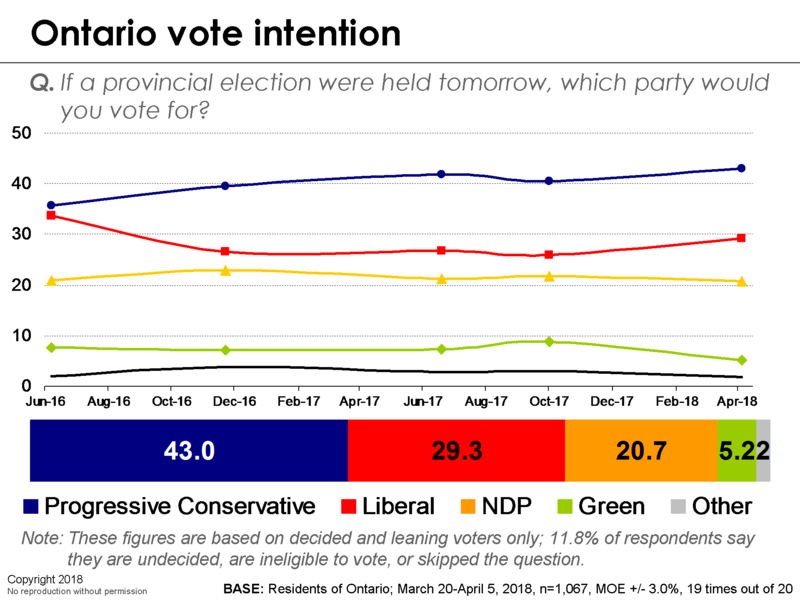 However, current polling does not provide the basis for a comfortable forecast of the next Ontario election; there isn’t an election tomorrow and the Ontario Liberals have shown surprising resilience in the last three provincial elections. The Ontario Liberals have a daunting challenge in closing a 14-point gap, but the NDP find themselves mired at the same inauspicious levels they achieved in the last election. Without a major disruption, the NDP may serve only to split enough of the centre-left vote to assist a Doug Ford majority. This could, of course, change. There is a huge gender gap in voter preference. Neither the Liberals nor the NDP have any strength with male voters. Doug Ford has a huge lead here. If the election was going to be based on women’s vote, it would be a highly competitive race between the PCs and Liberals. To have any chance of winning, the Ontario Liberals have to do considerably better with male voters. The Ontario Liberal vote skews heavily to those with higher socioeconomic status. 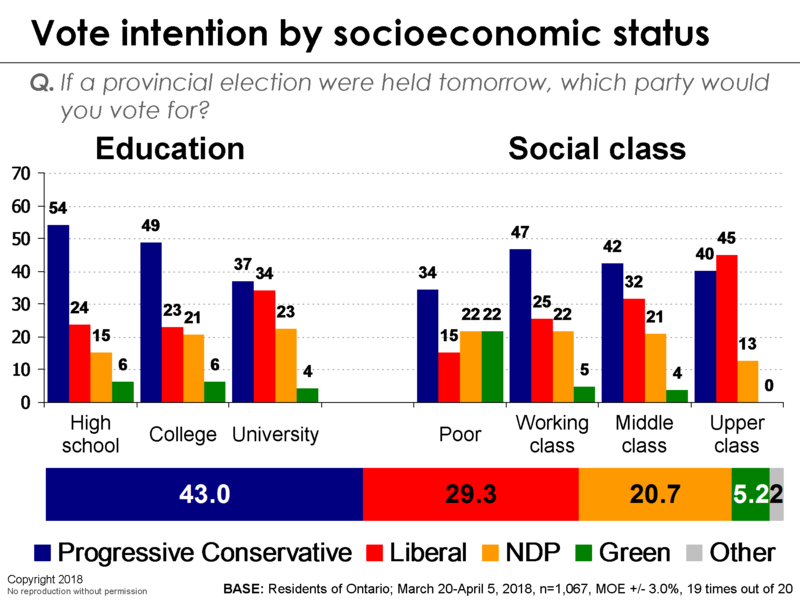 The PC vote is very strong among middle class voters and they have a huge lead with working class, as well as a modest lead with the poor. They also do much better with college and high school educated. This mirrors the populist constituency that propelled Donald Trump to victory in the United States. 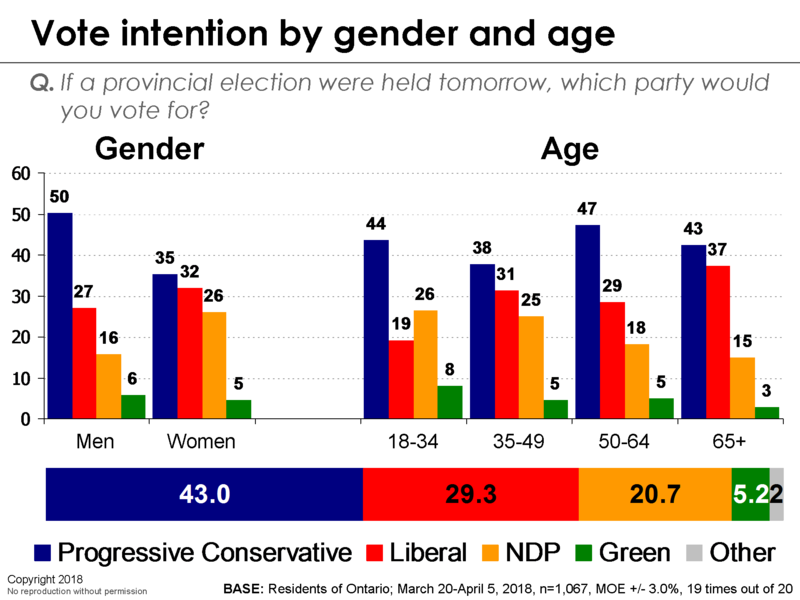 Doug Ford is also doing surprisingly well with younger voters, but they may not be highly engaged at this point. The Tories lead across the province except in Toronto, where they are still in a statistical tie with the Liberals. Within Toronto, the Liberals are ahead in the central part of the city, while the PCs are ahead in the suburbs, which is the heart of “Fordnation”. The NDP doesn’t lead in any region, though they are a distant second place in Southwestern Ontario. The Tories’ best regions are their heartlands of Eastern and Central Ontario and Southwestern Ontario, which is where they won a bulk of their seats in 2014. Of note, they also have large leads in the seat-rich outer Greater Toronto Area (i.e., outside of the city itself). This area of the province is key for any party to win in order to form government. The Tories also have a significant lead in Ottawa, another area the Tories haven’t won since last winning government. The field dates for this survey are March 20-April 5, 2018. In total, a random sub-sample of 1,067 residents of Ontario aged 18 and over responded to the survey. The margin of error associated with the total sample is +/- 3.0 percentage points, 19 times out of 20. Interesting to see 22% of the “poor” category leaning towards the Green Party. Have they done anything in particular to appeal to this group? (Evidence from France, Britain and the US, 1948-2017)”. (Easy enough to find on the Internet).